Things is bad bad in da Gret Stet of Loosiana, cher. Dey so bad don't nobody know what ta do, baby! An' one uh da congressmens say evuhbody laughin' at Loosiana. He say things has gots to change, 'cause da stet can't be goin' on like dis. Mais no, he serious as a heart attack, cher. Lissen. . . .
"Ninety thousand of our citizens have left Louisiana in the last three years trying to find jobs and opportunities somewhere else." As long as the oil-patch jobs were there, it was easier to tolerate children getting a substandard education, he said. Foul air and dirty water could be ignored as long as the oil money kept rolling in, added the congressman. 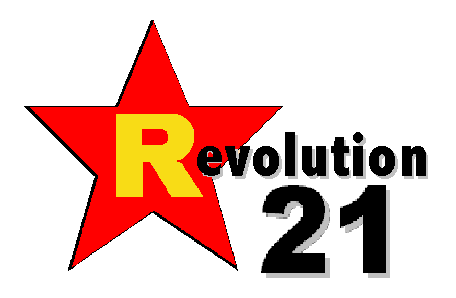 But he said the state could no longer put up with the chicanery and behind-the-scenes dealing of its politicians. "When the oil fields were booming and we were all making money and we were all prospering, we might have been able to tolerate some of the kinds of images we created in our political institutions," he said. DON'T BE LOOKING for that article in your morning paper. It won't be there. The story is true. The congressman was Billy Tauzin. The date of the newspaper containing the Associated Press piece . . . Dec. 5, 1986. 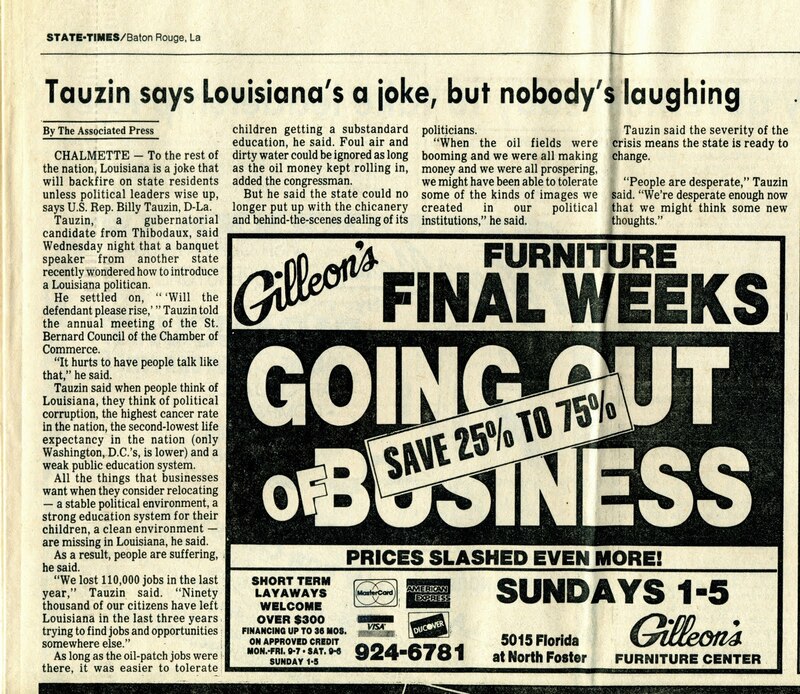 It was the State-Times in Baton Rouge, which ceased publishing in 1991. Tauzin said the severity of the crisis means the state is ready to change. "People are desperate," Tauzin said. "We're desperate enough now that we might think some new thoughts. YEAH, LOUISIANA. How'd that work out for you? Tauzin's fatal fallacy was in not realizing that in order to think new thoughts, you first have to think at all. And a quarter-century later, virtually nothing has changed in the Gret Stet. The only change after the oil bust of the 1980s was that, in 1991, Louisiana had "changed" enough to almost elect a Nazi as governor. It dodged a bullet by electing Edwin Edwards -- who now is an involuntary "houseguest" of the federal government -- to yet another term. Then, in 2005, Katrina came, and New Orleans almost disappeared forever . . . but not before exposing exactly how bad things had gotten on any number of fronts. Talk about a clarion call for "change." 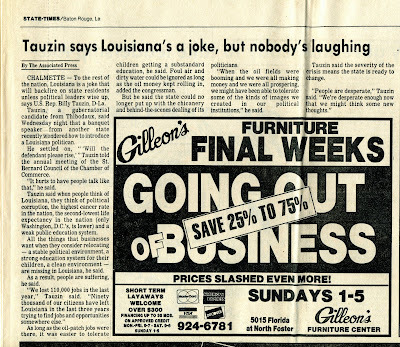 Yet politicians from Slidell to Shreveport are still answering to that standard introduction Tauzin so fretted over in 1986 when it was put to him as banquet humor -- "Will the defendant please rise?" And Louisiana children still receive inadequate educations, in many cases inside facilities unfit for animals. And Louisiana people are still some of the poorest anywhere in the United States. And "Cancer Alley" is still there between Baton Rouge and New Orleans. And long stretches of the coast are now fouled, thanks to a different kind of "oil boom." And Louisianians -- scores and scores of them -- are still leaving in search of something better. THIS BEGS a rather obvious question. Exactly how desperate is desperate enough that Louisiana might think some new thoughts? Or, for that matter, start to think, period.